As many organizations want to support mobile, team-oriented and nonroutine ways of work, an increasing number of them are looking for assistance in adopting digital workplace technology. A Gartner survey concluded that only 7 percent to 18 percent of organizations possess the digital dexterity to adopt new ways of work (NWOW) solutions, such as virtual collaboration and mobile work. An organization with high digital dexterity has employees who have the cognitive ability and social practice to leverage and manipulate media, information and technology in unique and highly innovative ways. By country, organizations exhibiting the highest digital dexterity were those in the U.S. (18.2 percent of respondents), followed by those in Germany (17.6 percent) and then the U.K. (17.1 percent). “Solutions targeting new ways of work are tapping into a high-growth area, but finding the right organizations ready to exploit these technologies is challenging,” said Craig Roth, research vice president at Gartner. In parallel, the survey found that workers in the U.S., Germany and U.K. have, on average, higher digital dexterity than those in France, Singapore and Japan (see Figure 1). Workers in the top three countries were much more open to working from anywhere, in a nonoffice fashion. They had a desire to use consumer (or consumerlike) software and websites at work. 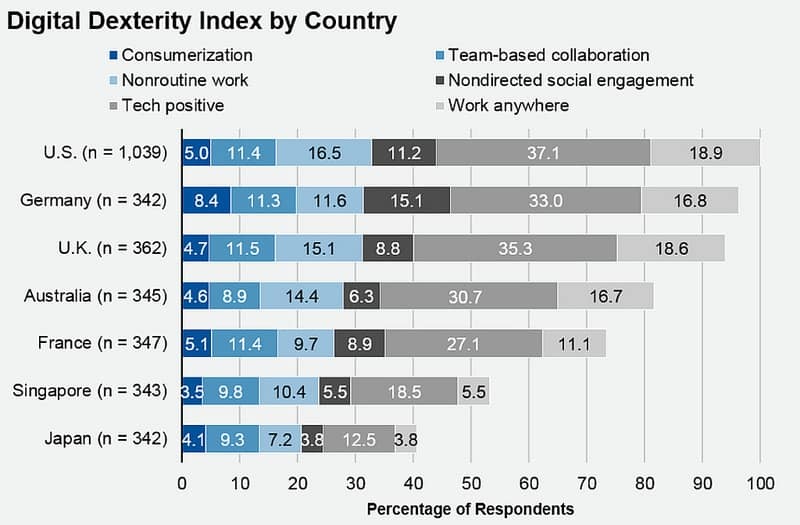 Some of the difference in workers’ digital dexterity is driven by cultural factors, as shown by large differences between countries. For example, population density impacts the ability to work outside the office, and countries with more adherence to organizational hierarchy had decreased affinity for social media tools that drive social engagement. Workers aged 35 to 44 were at the low point of the adoption dip, potentially feeling fatigued with the routines of life as middle age approaches. 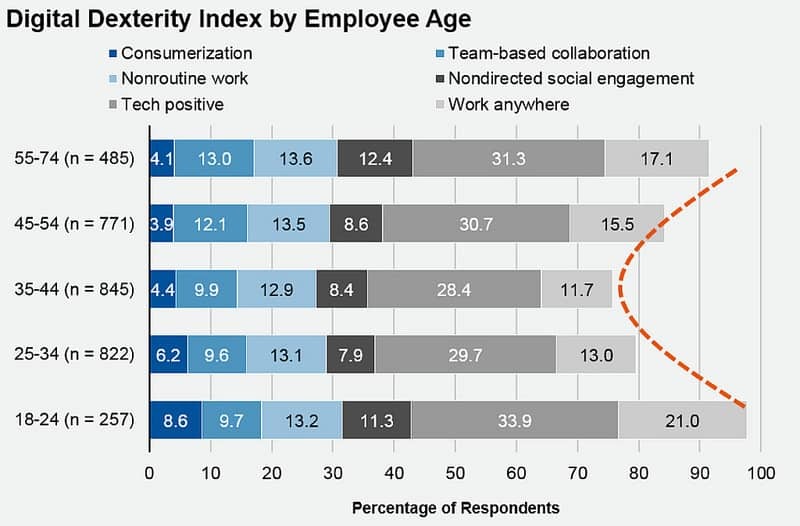 They were most likely to report that their jobs are routine, have the dimmest view of how technology can help their work, and are the least interested in mobile work. Very interesting results! I would say, companies have some work to do regarding training their employees. Digitalization is happening and if you don’t keep up you get left behind (talking companies and their responsibility to educate their employees). What also could help is using digital tools that are so simple and similar to what people are already used to, that people get used to it really quickly, such as Workspace 365 or Cloud 1 Workspace. That would also help with keeping up with the remote working trend, as long as your type of work allows you to.